Another great speaker from May's Games For Health Conference in Baltimore was Tom Söderlund with his Alpha version of Zyked. In its current version (internet and mobile service) it aims "to make sports and exercising more fun by adding gameplay and community features." I really think this area of "exergaming" will see the most growth in the near future as it requires less equipment and technology than any exergaming/interactive fitness/video game exercise gaming system. To find other Exergame Lab articles featured ubiquitous computing applications click here! Another well known exergame is the combo Tamagotchi-like Fizzes project from the UK 's FutureLab - although there isn't a strong tie to ubiquitous computing the goal is to keep your virtual pet by staying active. With the number of games and platforms like this - in 2009 we will undoubtedly see at least another 5-10 similar products like the earlier featured:ME2, Jinsei Game Puchi (AKA - Game of Life) Pedometer, "Sportio - au Smart Sports Run & Walk, and miCoach. 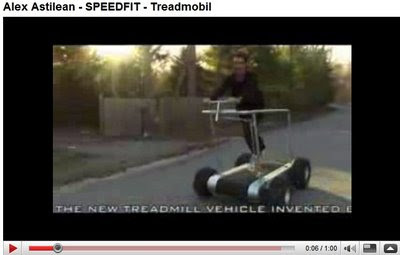 How does this look for the ulitmate environmentally friendly exercise machine = your next car! Yes, this is just a concept car by Da Feng, a design student from Coventry University, but let's think about it for a second. You get a workout, get to work, and create little pollution,...now that's the TRIFECTA. In case you were wondering, here is the workout gear incorporated into the proposed lightweight injection molded magnesium alloy chassis - step machine, rowing machine, bench press, pull up simulator and arm weights. If only it weren't in mu driveway right now. 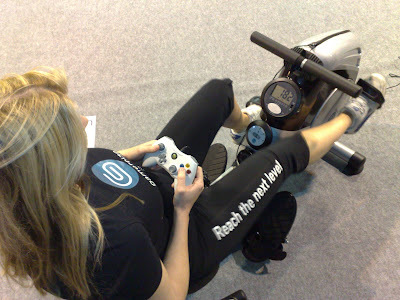 With an EXCLUSIVE 1st look at GZ Spin Trainer and GZ Family Fit-3-in-1 Combo-Cycle-Rower, it looks as if Richard and company (Gamercize) have been busy. These pictures were taken at a School Sport Partnership Conference (SSPC '08) recently and from all accounts are some of the first images available on the web. These new lines will go on sale in the new year. I'll update on the price when I get clarification from Richard. The full sized spin bike will join the existing range of portable stepper and cycle exercise machines that have proved hugely popular. 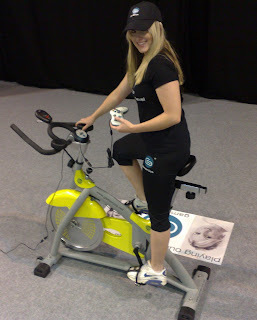 The GZ Spin Trainer represents the highest end of exergaming fitness training and will be available for PC, Xbox 360, PlayStation 3 and Nintendo Wii. The GZ Family Fit will be available for Xbox 360, PlayStation 3 and Nintendo Wii and will also be fully compatible with all existing Gamercize products. However GZ Family Fit (from what I understand) is a fully functional recumbent bike which should make it easier to peddle compared to the GZ Endurance Cycle which requires more of an elevated seated position. It is also a fully operational rowing machine, however I'm not sure how or if you could even play a game while rowing - now that would take talent. I will find out more details and let you know. That is if there's anybody out there reading this! From ngmoco :) comes the latest iPhone/iTouch game, which starts in motion my predication of 12 games over the next year and only means that I have to get in iPhone (or at least an iPod Touch) to try out all these games. Got to be in the know, no? 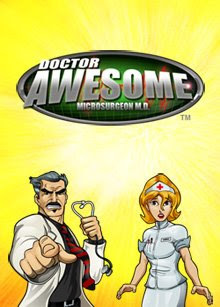 For $1.99, you get to save your friends and family in your contact list from a deadly viruses. Save the Cheerleader, Save the World. Not to be be outdone by a special "little-known fact" hidden in the iPod SDK recently released, allows you to use your iPhone/iPod Touch as a full-fledged TV game device. 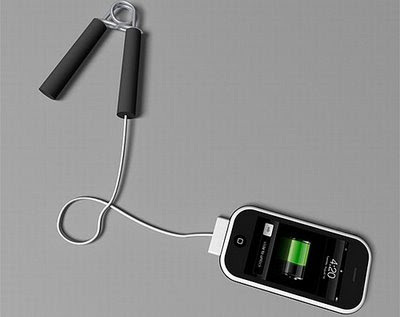 Seeing the sharp rise in sales of smartphones including the iPhone, it was only a matter of time before these battery-charging concept devices surface. 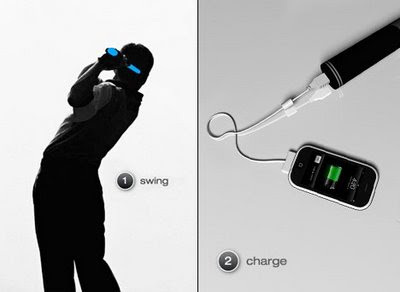 First mentioned was the handgrip charger and now a swing charger with an added bonus of having your golf swing analyzed. I think we really should think of other ways to harness our own energy because now being physically active would be: 1) enjoyable, 2) energy saving (reduces carbon footprint), 3) money saving (electrical chargers), and even ....get this....4) healthy. The potential to harness kinetic energy into stored electrical energy is not new, and a while back there was a dance floor concept from the Netherlands (Sustainable Dance Club) that proposed using technology to store the energy created by the moving dancers in a night club. 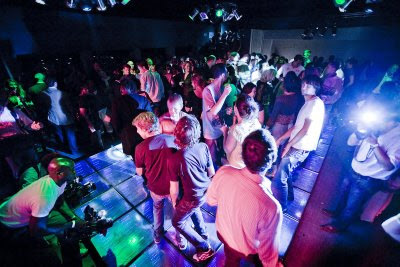 The dance floor converts the movement of the dancing crowd into electricity and uses this power to change the appearance of the surface of the floor. For the first time the crowd becomes an energy source that can contribute to power a club. The movement of the clubbers on the dance floor is captured to generate electricity. This electricity is used to create interaction using LED lights and smart materials in the floor. The DJ and the clubbers will be challenged to reach the maximum energy level possible. 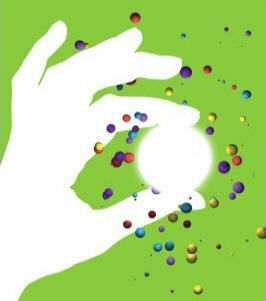 Every person is able to produce 2-20 Watt, depending on people’s weight and activity. Dance on, Swing on, just move my friends! It's all good! Two recent posts that show how we're continuing the trend to bring the indoors outside (or is it the other way around), Treadmobil by Speedfit and the Treadmill Bike by Bicycle Forest. Not sure if either device will make it big, but it's great to see people following and acting out their wildest dreams. How boring would the world be without dreams and higher goals. 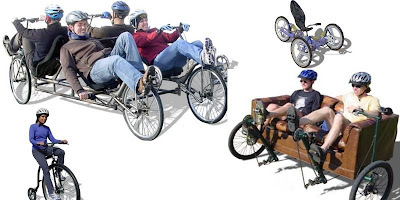 Check out lots of other crazy inventions at Bicycle Forest's website including the recumbent rowing bike, kickbikes, Family Truckster and Couch Bike. Great imaginative stuff! 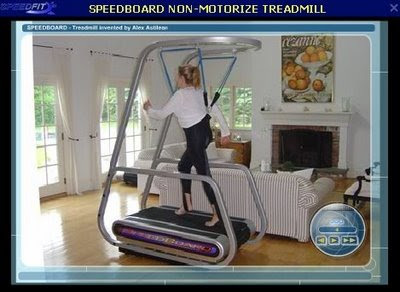 On Speedfit's website, I also found this image of what looks to their non-motorized treadmill called SpeedBoard. They are demonstrating either a woman walking for therapeutic or rehabilitative reasons with the included harness.